1) SPA Under the Big Top – St. Paul the Apostle School Fall Festival, 1536 Selby Ave. Dates & hours: Fri, 10/12, from 3 pm – 9 pm; Sat, 10/13, from 12 pm – 9 pm; Sun, 10/14, 10 am – 6 pm. Games, food, carnival rides and more! 2) Fairburn Elementary School Annual Fall Festival – Sat, 10/ 20, from 12 pm – 4:00 p.m. on the Fairburn schoolyard. Bouncy Houses, carnival games, cookie decorating, pumpkins galore and so much more! 3) Westwood Recreation Center’s “Incredible Halloween” – Sat, 10/27, from 4 pm – 8 pm. 4) Warner Ave. School Halloween Haunt – Sun, 10/28, from 11 am – 4 pm. Carnival games, inflatables, arts & crafts, Haunted House and more! Houses must be painted, maintained and in good repair, including wood siding, porch flooring, steps and railings, windows, screens, roofs and exteriors. (LAMC 91.8104.1). UCLA Vice Chancellor Michael Beck will discuss UCLA plans and operations at a meeting of the Westwood Community Council on Monday, September 17. The meeting, which begins at 7 p.m. and is open to the public, will be held at Belmont Village Westwood, 10475 Wilshire Blvd. Parking is available under the building. A complete agenda is available at http://www.westwoodcommunitycouncil.org. Cellos will be center stage as 8 Brazilian Cellists perform at Westwood Library Concert. Join us for the first concert in the 2018 Season of our popular FREE Concert Series @ Westwood Library. We’ll be upstairs in the library on a Sunday afternoon when the library is not open for regular business. We’re fortunate to be able to welcome 8 BRAZILIAN CELLISTS for this fabulous concert of catchy, rhythmic Latin American music. Don’t miss it! Admission is FREE, with FREE parking at the library. Library garage and doors open at 2:00 p.m. Concerts last approximately one hour, with no intermission. After the concert, meet the musicians and enjoy a complimentary reception hosted by Westwood restaurant MAHARAJA CUISINE OF INDIA and the Friends of Westwood Library. Our Councilmember Paul Koretz and our Assemblymember Sebastian Ridley-Thomas are guest speakers at the WHPOA Annual Meeting scheduled for Tuesday November 1, 2016, at Westwood Presbyterian Church, 10822 Wilshire Blvd. (next to the iPic Theater). Also appearing is our wonderful Los Angeles Police Department Senior Lead Officer Chris Ragsdale. Come at 6:30 p.m. for socializing and munchies. The agenda starts at 7 p.m. with election of Board members. Our annual meeting is always a great opportunity to meet our elected officials and greet old and new friends. Thanks to our sponsors Larry Young, Larry Young Westside, Berkshire Hathaway Home Services; Carole Schiffer, Caldwell Banker; Nancy Eisenstadt, Parners Trust; Whole Foods Westwood, and The Corner Bakery Cafe. Soon after our WHPOA Board discussion of the DWP’s offer to compensate homeowners who replace turf with water-saving plants, I noticed that UCLA is re-landscaping the area near the Law School and Murphy Hall with lots of really terrific looking drought tolerant plants. These campus plants would also grow well in our gardens, so I asked for the plant list, which UCLA’s Office of Sustainability was happy to provide along with the information that the campus has pledged to replace 73,000 square feet of ornamental turf as part of its response to the Mayor’s call for a sustainable Los Angeles. 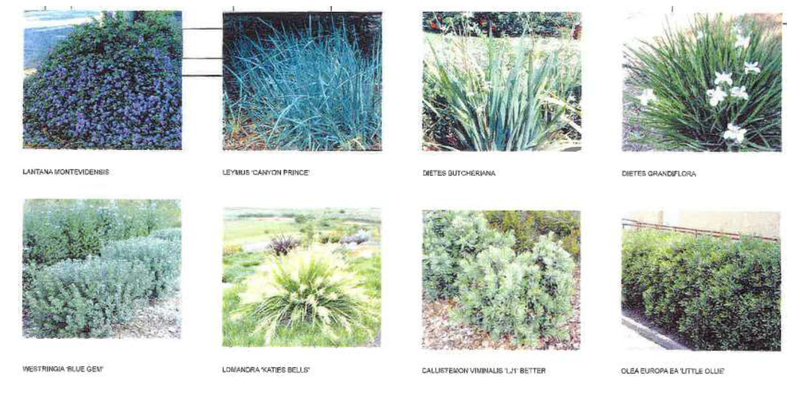 The plants currently being installed near the Law School include Lantana Montevidensis; Leymus “Canyon Prince”; Dietes Butcheriana; Dietes Grandiflora; Westringia “Blue Gem”; Lomandra “Katies Bells”; Callistemon “Lil Better”; Olea Europea “Little Ollie.” The campus has other interesting drought-tolerant plantings, including sedges and meadow grasses at Stein Plaza and meadow grasses opposite Parking Structure 2.